Menu language: English. Subtitles: Italian (original language), English, German, French, Spanish, Chinese. 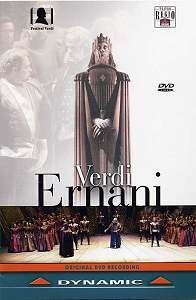 Ernani is the fifth opera in the Verdi canon and is based on Victor Hugo’s play Hernani. It was first performed at the Teatro la Fenice, Venice, on 9 March 1843. In the Verdi oeuvre it follows directly after Nabucco and I Lombardi premiered at La Scala in March 1841 and February 1842 respectively. These works had been resounding successes and placed the thirty-year-old Verdi alongside his older compatriot, Donizetti, at the forefront of Italian opera composers. When the Society that owned the Gran Teatro la Fenice in Venice assembled to decide on the names of opera composers for the coming season Verdi was high on their list. La Fenice was La Scala’s biggest rival in Northern Italy and was the theatre where Rossini had won international fame with Tancredi in 1813 and also concluded his Italian career in triumph with Semiramide in 1823. After that performance Rossini was escorted to his lodgings by a flotilla of gondolas, a water-borne band playing a selection from his score. A success in Venice had its own particular flavour and the prospect was an attraction for Verdi. Count Alvise di Mocenigo, president of La Fenice, entered into correspondence with Verdi, much of which survives. The composer, aware of his increasing value drove a hard bargain by which La Fenice would stage I Lombardi as well as presenting the new opera to a libretto of Verdi’s own choice. To write the verses he chose Piave, a native of Venice, and who was to be his collaborator in many subsequent works. Although the subject of Ernani had already been featured in operas by others, and even considered by Bellini, Verdi’s music brought out the story as no other had done before. Verdi’s Ernani is written in traditional form with arias, cabalettas and group scenes with virile chorus contributions an additional attraction for composer and audience. Verdi brings out the character of the conflicting roles, and their various relationships, so that each has clear identification in the music. This manner had, perhaps, been missing in his earlier successful operas, which had succeeded on the basis of the popular appeal of their thrusting melodies. Ernani has a density of musical invention and melody that is perhaps only matched by Macbeth before being equalled in Rigoletto, all with libretti by Piave, and the great mature period operas that followed. Nevertheless Ernani had only a moderate success at its premiere, the vocal limitations of some of the soloists being to blame and it had to wait until productions at Vienna in May 1844, and La Scala six months later, for full recognition of its qualities. For the La Scala performances Verdi made additions to the role of Silva. These included an added cabaletta in act one to accommodate the distinguished bass of the time and promote the role from comprimario to primo basso. Ernani was the first of Verdi’s operas to be translated into English and was admired by George Bernard Shaw. Ernani remained in the Italian repertoire in Verdi’s lifetime, falling from favour in the early part of the twentieth century; even today performances are scarce. Initially this perhaps reflected a period of suspicion of early Verdi as being superficial; nowadays a shortage of voices able to do it justice is a drawback. In the UK, Sadler’s Wells Opera staged the work around 1967 but did not tour it and I had to travel to London to catch a first glimpse of it in stirring performances at the home theatre. Twelve years later Welsh National Opera and the Royal Northern College of Music shared a production by Elijah Moshinsky in easily manoeuvrable and evocative sets. Both have revived the production since and I have not had a bad night in several viewings with different casts. In view of Verdi’s easily listened-to melodic invention I am surprised at the paucity of recorded versions in the original language. As I note in part 1 of my Verdi Conspectus studio recordings are relatively few. In that medium the 1967 Rome recording with Bergonzi as Ernani and Leontyne Price as Elvira remains the best-sung version (RCA), really only being challenged by the1982 live La Scala performance under Muti of Luca Ranconi’s production with the starry cast of Domingo, Bruson, Ghiaurov and Mirella Freni (EMI). This is also available on DVD and a Review by a colleague can be seen. The most recent original language studio recording features the final collaboration on record of Joan Sutherland and Pavarotti with support from Nucci and Burchuladze under Bonynge. Made in 1987, it sat in Decca’s vaults for eleven years before seeing the light of day. To my ears the reason is not difficult to determine with the diva’s heavy vocal beat, lack of steadiness and poor diction being only one drawback. A colleague’s review is on this site. When reviewing this performance on CD I recounted that I had never had a bad night in the theatre with Ernani in the UK. Being impressed by the photographs of a resplendent staging in the accompanying booklet. I conjectured that a DVD might have distracted from some rather variable singing, particularly from the male soloists. That is in fact how it turns out. Marco Berti’s rather tight top is not improved by his wooden acting but his dry tone (Part 1 CH. 4) does warm as the performance progresses (Part 2 CH. 8) and even exhibits signs of vocal sensitivity in the finale (Part 4 CHS. 4-5). Both Carlo Guelfi as Carlo and Giocomo Prestia are physically imposing, the latter’s acted portrayal of the old and implacable Silva being particularly convincing. There are times also when Carlo Guelfi’s strong tones as Carlo enable the dramatic situation to come over in a ‘better seen than merely heard’ manner as when Carlo first threatens dire consequences on the plotters, but after his elevation to the crown of Charlemagne is more clement (Part 3 CHs. 4-7). The other side of the coin comes with Susan Neves as Elvira. She is by far the strongest and most vocally secure and elegant singer in the cast, but she tends to float around the stage like a galleon in full sail in her ornate full-skirted 16th century costumes. Her introductory Sorte la notte to Ernani involami (Part 1 CHs. 5-6) is a little tentative, but once into her stride her full-toned voice, with good variety of tonal colour of modulation, is a greater strength when heard; her poor acting is a distraction from her vocal strengths. Antonello Allemandi’s conducting is variable in tempi between the fast, for the trios of Part 1 and 2, and a more languid approach for the solos where he seems over-eager to support his singers by allowing time for them to phrase, but putting them under extra pressure to hold the vocal line. He ups the tempi for the vibrant choral singing of Ernani’s troops, which is as viscerally thrilling as early Verdi scenes of this nature should be, particularly with the chorus in virile voice as they are here. Important as the singing and playing are, which is what you get on CD, the virtue of DVD is seeing the performance. If the direction, sets and costumes are true to the composer and allied to even reasonable acting, many of the limitations of the aural performance are mitigated. This is the case with this fine staging and production from Teatro Reggio recorded during the annual Verdi Festival in May 2005. There are no stage props and the direction and sets serve to illuminate the plot and the music without the interference of the dreaded producer concept and which so often comes, in my case at least, in the way of enjoyment. The theatre looks quite intimate (CH. 1) and which might indicate a comparatively small stage area. This would explain the appearance of the rear stage scenery as appearing curved towards the audience, except its centre which portrays aspects of Silva’s castle. In Part 3 you will note the large upright effigy of Charlemagne’s tomb; it swings round to an imposing screen door. The first scene of Part 1 is rather dark but thereafter lighting and varied, in-period costume colours give vivid life to the evolving drama. The director has the chorus well regimented in tableaux form, which does tend to make some of their marginal out-of-sync movements rather obvious. As an eminent singer once told me, Italian choruses do not do acting involvement in the wholehearted and committed manner of those of British opera companies. But I forgive the minor visual incongruities for the native squilla and vibrancy they can bring to their contribution, particularly in early Verdi, and that is what they do in this performance. The sound is good although in the finale I detected some momentary echo on the voices (CHs. 4-5). The accompanying booklet has a synopsis, an introductory essay and black and white photographs of the production. In the usual, but idiosyncratic manner of Dynamic, the Chapters are numbered from 1 in each part. This doesn’t make it easy for a critic to go back and double-check details.